This assessment determines the degree to which you use each of four influencing strategies with the emphasis on strengthening your weakest influencing styles and understanding when each style is most appropriate. With any employees who need to learn how they influence others in order to improve their effectiveness in the workplace. With team leaders, internal consultants, trainers and project managers or others who need to influence without direct authority. With sales and customer service people who need to influence customers and recognize the best influencing strategy to use with an individual customer. As an introductory training activity on Influencing styles to teach participants about their own predispositions and how to use all influencing styles when they are most appropriate. As the center piece of a 1-day facilitated training workshop on influencing styles. 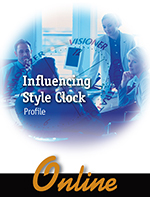 · Influencing Styles Clock feedback report — Displays the participant’s primary and secondary influencing styles. The report provides positive uses for each of the four influencing styles, information on applying influencing styles and how to develop your less used influencing styles. · Relevant feedback – In addition to your specific profile information the feedback report contains an Individual Development Plan template that can be used individually or in a class for setting goals, recording development actions, and progress toward goals. · Measures 4 Influencing styles through 32 items, and provides a wealth of information on how to apply influencing styles more effectively and use all 4 influencing styles when each is most appropriate. · The report is broken into ten smaller reports. Reports begin with an introduction to Influencing styles followed by your individual assessment results and then detailed explanations of how to use your style information.